This intensive block was grafted to a double leader system two years ago – it is now set up for a substantial third leaf crop. The focus at the moment will be on harvesting the later varieties, mainly Cripps Pink, Cripps Red, and maybe Fuji and Granny Smith. With red and partially red varieties, colour is important, so a lot of effort should go into lifting it. This is particularly so with Cripps Pink where those meeting the Pink LadyTM specification have an orchard gate value of around two to two and a half times the value of those that do not. The best long term solution to poor colour is to graft over or replant with high colour strains. There are now good high colour strains available for many of our established varieties. And with lots of our orchards now planted intensively on dwarfing rootstocks it is relatively easy to change variety. If well planned and executed, the orchard is back in production within two or three years. In order to make rational decisions on future crop husbandry it is necessary to have good data on present crop performance. Immediately after harvest is a good time to do this job. The same block as pictured above after its first pick – most of the crop was harvested in the first pick and will packet well with little handling damage. I also consider viewing the orchard just ahead of harvest a necessary part of orchard performance appraisal, as is block by block analysis of yield and packout performance. By now, early varieties have probably been packed so their harvest and outturn data is already there. Even though later varieties have yet to be harvested there may be a benefit in analysing earlier variety packout performance because it may highlight harvest management on quality issues that can be addressed in the later varieties. Take particular note of harvest maturity and handling problems such as bruising and stem punctures. These defects often account for a significant proportion of the crop and, with better maturity monitoring as well as good harvest supervision, there can be large improvements in Class 1 fruit recovery. Our experience shows that handling damage is often associated with more mature fruit so keeping on top of fruit maturity makes for easier harvest and improved packouts. 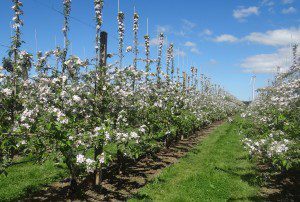 Cripps Pink is increasingly sensitive to bruising as fruit maturity advances. Here we have a raft of other varieties as well that behave in this manner so we place high priority on advancing fruit colour development ahead of fruit maturity parameters so that most, if not all of the crop can be harvested early in its harvest window when susceptibility to bruising and stem puncturing is low. It is not unusual to see a 20 per cent lift in Class 1 fruit recovery from fruit harvested at the beginning of the maturity window compared to fruit harvested later. This red strain of Cripps Pink has good uniform fruit colour and is ready for its first pick. Apart from a bit of leaf plucking, late summer pruning and reflective mulch, there is not a great deal that can be done now to improve later season variety colour for this harvest. Application of growth regulators such as ReTain® to delay harvest and prevent premature fruit drop may be worth considering in locations where a delay in maturity of 7 to 10 days may move harvest into better weather conditions for colour development. The down side of this approach is that if the better colouring conditions fail to eventuate fruit colour may not lift and could end up worse than without treatment. Fixing colour problems is really a whole season crop husbandry task. It has to start with careful consideration of the fertiliser programme, particularly nitrogen. As harvest approaches, nitrogen status needs to be bordering on the deficiency range, if not deficient. In the case of Cripps Pink leaf nitrogen levels at harvest need to be 1.5 to 1.9 per cent. However, these low nitrogen levels need to be lifted into the optimum range smartly once the high fruit colour is locked in, otherwise there will be increased problems with biennial bearing and poor fruitset next spring. Some trees in this block had excellent colour with harvest nitrogen leaf level of 1.5 per cent. As part of our orchard nitrogen nutrition programme we advocate several foliar urea sprays at around 2 per cent concentration immediately after harvest to lift nitrogen status quickly. Autumn soil dressings of nitrogen are also necessary because root nitrogen levels in the post-harvest period play a key role in next season’s spring growth flush and fruitset. Where nitrogen levels are known to be marginal, pre bloom foliar nitrogen sprays may be necessary as well. Pruning practices have a key role in determining fruit colour development. Good light penetration is necessary for colour development. Once full canopy has been achieved, well-spaced low vigour branches that allow good light penetration into the lower canopy are necessary to maximise fruit colour. Strong growth branches need to be pruned out. It is these stronger growth branches that are responsible for most of the shading in a tree canopy. Your fruit thinning strategy has a huge influence on colour development. Where above 70 to 75 per cent fruit colour is required, the crop needs to be thinned to singles to allow uniform colour development right around the fruit. This means a large fruiting canopy with well-spaced fruit. This tree is in the same block as pictured above but because of higher nitrogen, the fruit has failed to colour. Note the comparably dark green foliage. Crop load also has a huge influence on fruit colour development. Where crops are too heavy there is dull colour and it arrives late in the harvest window if at all. Once a tree has grown enough leaf and bourse shoot to support its crop, any further growth represents lost fruiting potential. A mature tree canopy needs to make only 20 to 30cm of annual extension growth to satisfy its foliage and replacement fruiting wood requirements. Appraise the level of vigour in a block carefully. In many orchards there is irregular tree vigour due to site or irrigation factors. As canopy uniformity is absolutely critical to high orchard performance any variation in tree size or vigour behaviour needs investigation to determine cause and formulate possible solutions. There is probably potential to lift yields in the order of 50 per cent without compromising fruit quality if tree canopy variation can be solved. Girdling and root pruning are very useful vigour control tools. This standard Cripps Pink looks like a red strain because it is nitrogen deficient with leaf nitrogen of 1.2 per cent. The block set a light crop due to nitrogen deficiency – note the very pale lemon foliage. Unless nitrogen levels are built up to the critical level for fruitlet by flowering, next year will have a light crop too. It will need foliar urea applied post-harvest and again in the spring, plus soil-applied nitrogen fertiliser. Now that we are beginning to push the upper limits of yield, it has become apparent that poor tree support can limit both yield and fruit colour. Leaning trees shade the lower canopy much more than upright trees, while poor tree support puts additional strain on support structures, so it is not unusual to see rows of trees fall over. Check your support structures as harvest approaches and if there are problems use old fashioned tree props to minimise disaster. Immediately after harvest, trellis system maintenance needs to be given high priority. Incidentally, in our modern production systems where crop yield is an important vigour control tool, it is necessary for good tree support on stronger rootstocks too because we need to fully crop trees before their leaders become strong enough to support the crop. Apple tree roots are very sensitive to water logging during the growing season and will not thrive where the soil is devoid of oxygen. As part of your orchard appraisal, check on root health and in particular, drainage. Root systems have two main growth flushes a year, one in the spring before the crop load becomes the main photosynthate sink and the second immediately after harvest. The post-harvest root flush is very important for building up the stored nutrient reserves needed to kick start next spring’s growth flush. Roots will not grow in dry soil so to get off to a good start next season it is advisable to irrigate after harvest if drought conditions exist. Colour development is very good on this well thinned low crop of Fuji, which had an effective chemical thinning programme. Colour is poor on this heavily cropped Fuji tree, which did not have a chemical thinning programme. Netted orchards need pollinators planted in every row. Over harvest is a good time to check on how successful pollination has been. Where there is poor pollination fruitset can be erratic, with steep fruitset gradients around pollinators. Pollination problems can also lead to irregular shaped fruit that, for a fussy customer, can lead to high Class 1 rejection rates. Where orchards are netted, adequate cross pollination is often difficult to achieve because there is less cross row bee movement. Pollinators need to be in every row at about 20m apart for apples and maybe closer for pears. Isolated orchards also generally show weaker pollination than orchards in an area where pome fruit production is the dominant land use. APAL’s Future Orchards® program is funded by Horticulture Innovation Australia Ltd using the apple and pear industry levy funds from growers and funds from the Australian Government. AgFirst is a key Future Orchards partner. John Wilton is a Horticultural Consultant at AgFirst – New Zealand and can be contacted on +64 6 872 7080 or hawkesbay@agfirst.co.nz.